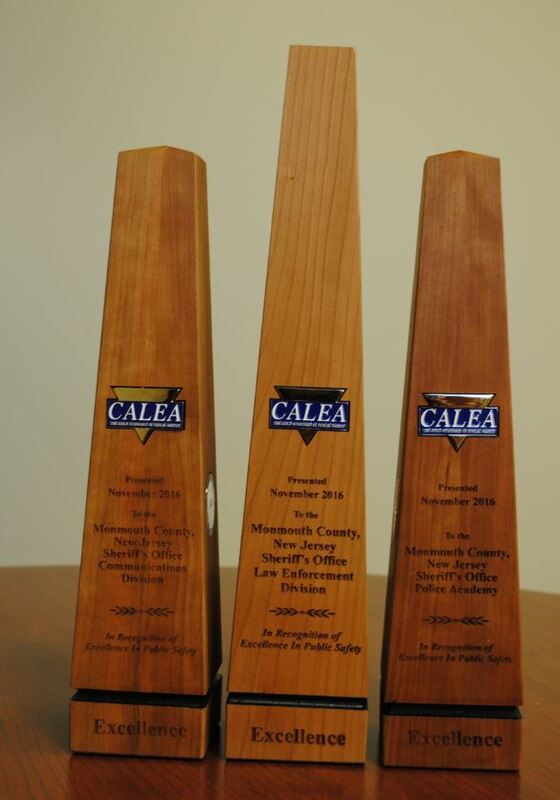 Monmouth County: Sheriff Shaun Golden is honored to receive the TRI-ARC Award which was presented to the Monmouth County Sheriff’s Office this past weekend at the Fall 2016 CALEA Conference, held in Charleston, South Carolina. The agency is the 16th recipient of the TRI-ARC which was created in 2004. It recognizes agencies nationwide, that have been concurrently accredited or reaccredited in law enforcement, public safety communications and public safety training, all within a year’s time. The Monmouth County Police Academy was fully accredited for the first time and the Law Enforcement Division received its seventh re-accreditation during this past weekend’s conference. In July the Communications Division was re-accredited for the sixth time by CALEA. The Monmouth County Sheriff’s Office is the only law enforcement agency in the state of New Jersey with accreditations in all five areas of operation, which include law enforcement, public safety training, communications, corrections and correctional healthcare. 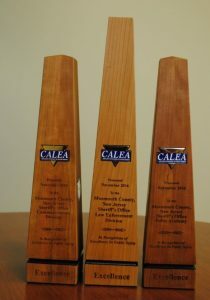 In addition to the Monmouth County Sheriff’s Office, previous recipients of the TRI-ARC Award are the Alameda County Sheriff’s Office-Ca, California Highway Patrol, Maryland State Police, Secretaría de Seguridad Pública del Estado de Baja California, St. Louis Metropolitan PD, Newport News PD-Va, Shelby County Sheriff’s Office – Tenn, Las Vegas Metropolitan PD, Maryland Transportation PD, Nashville Tenn, Roanoke Va, Arlington Texas, St. Louis County, Missouri, Prince William County, Va & Knoxville Tenn.